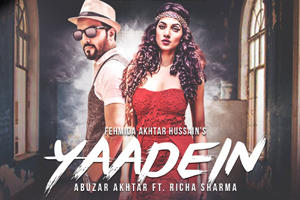 Hindi Lyrics 4 U: Lyrics Of Yaadein" From Latest Album - Yaadein (2016). Lyrics Of Yaadein" From Latest Album - Yaadein (2016). A sad song sung by Abuzar Akhtar and Richa Sharma, with music composed by Sanjay Chandrashekhar. The video of this song is available on YouTube at the official channel Ampliify Times. This video is of 5 minutes 20 seconds duration. Lyrics in Hindi (Unicode) of "यादे"